Honolulu’s clever “Aloha” crosswalk, the handiwork of some anonymous artists, is eliciting admiration and smiles throughout the continental United States. But local officials aren’t so happy, calling the intervention an act of vandalism and a safety concern. Now, we have something in the neighborhood that residents like. It was never planned. No one had a meeting about it. Someone just wanted to make their neighborhood a better place and they just did it. Unfortunately, making your neighborhood a little more Aloha violates the Standard. Here’s where it hurts us most. 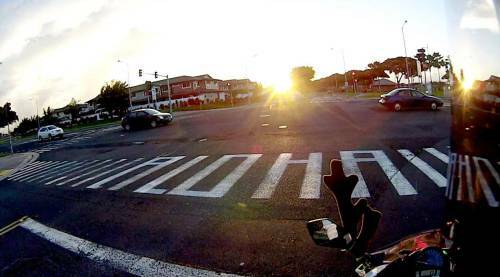 Does anyone really think the Aloha crosswalks are dangerous? Come on, don’t be stupid. It’s within the original template, works within the lines, and was painted only on the less busy side street crosswalks. To have a standard that is so inflexible is to say that we’ve perfected intersection crosswalks. We haven’t. Especially Hawaii which has some of the highest rates of pedestrian automobile-related deaths in the United States. This is where the City of Honolulu should be asking themselves: what has the standard gotten us? A whole lot of places people don’t enjoy being? Elsewhere on the Network today: Greater Greater Washington takes a look at the parking lot that redefined retail in 1931. Walkable Dallas-Fort Worth attempts to compare the costs of congestion with the costs of car dependence. And Tucson Velo explains three laws under review in Arizona that could make the state better for biking. Why Can’t We Have Traffic-Calming “3-D” Crosswalks Like Iceland? Federal transportation engineering guidelines conflate conformity with safety.